A project engineered by some of last year’s Year 5 students is set to kick off another eco-friendly year for the St Stephen’s School community. Determined to reduce waste around the campus and throughout the local community, the Year 5s spent most of 2018 creating innovative ideas to leave a positive environmental footprint. They decided a St Stephen’s School KeepCup would be the perfect way to encourage environmentally friendly habits by doing away with disposable cups. Students workshopped the design before releasing a survey to their parents and teachers, aimed at forming the perfect reusable cup. Opinions on the cup’s design and functionality were generally alike with most participants preferring a medium-sized, dishwasher-safe cup, while almost half the participants preferred a plastic cup over glass and stainless-steel. After lots of research and design, we are excited that the official St Stephen’s KeepCups are here! Not only are they super convenient, splash-proof and environmentally-friendly, they are dishwasher safe, non-toxic and BPA/BPS free. 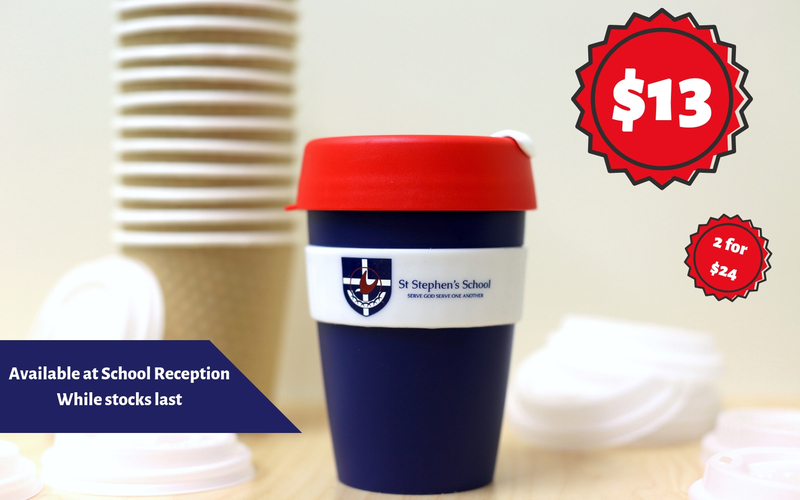 Buy your KeepCup from your School Reception for $13 each, or two for $24. Available while stocks last.